Fall is officially here and I feel the need to move up from baby sweaters to a nice cozy adult sweater for me!! At my LYS this summer I found a sale on Berroco yarn! I picked up five skeins of Vintage (worsted weight) in yellow. After perusing my Rav queue and much debate, I settled on Brick by Clare Lee from Raglanify. 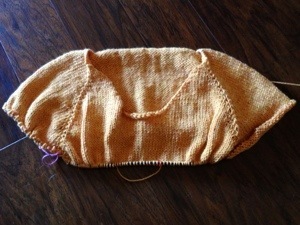 In the span of the weekend I have knit the entire yoke and divided for the sleeves. I’m in the body section of miles and miles of stockinette. But I will persevere! I cannot wait to get this done and to wear it!!! Yes, I’m completely hooked on crochet. So this month’s Lusty Eleven is all about fiber fun in general, including tutorials, beautiful handmade accessories and crochet ideas — all celebrating my new hobby. Hope you can get hooked too! Isn’t this the most beautiful crochet hook case? From elsiegeneva Etsy shop. Must learn how to make these gorgeous cuffs. Pattern from Ravelry! Tiny Owl Knits book, not crochet but I want to make everything! 100 Birds, Butterflies & Little Beasts to Knit and Crochet, yes I want to. Desperately wanting these owl shaped stitch markers from winemakerssiter’s Etsy shop. Learn to knit with Purl’ Soho’s knitting videos! I want to make beautiful fall things, like these beautiful maple leaves from LubaDaviesAtelier. Wahoo!!! My sweaters are done! 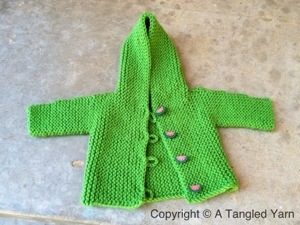 I used Knit Picks Dishie cotton and this first one is made in the 6 mo size. 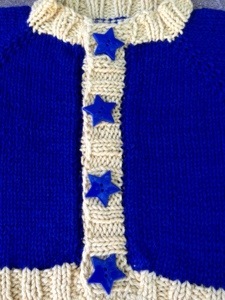 I chose to knit a solid body with the collar and bands in accent. 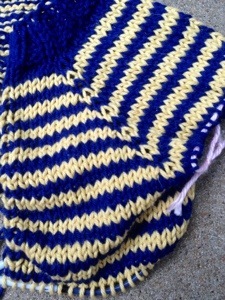 I ended up using 85.5 yards or 45 grams of the Creme Brûlée (yellow) and 180.5 yards or 95 grams of Jay (blue). And by popular demand the blue buttons won! 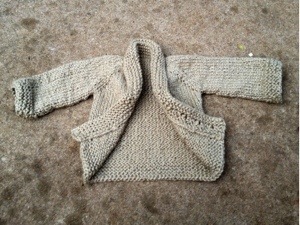 For this sweater, I used the same pattern but knit a 12 mo size to use up the rest of my yarn. 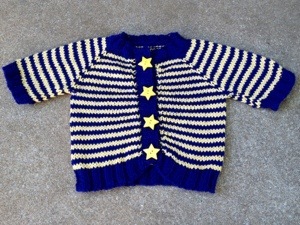 I also followed the instructions and knit the stripes. I used 104.5 yards or 55 grams of Creme brûlée and 199.5 yards or 105 grams of the Jay. And the yellow buttons were the obvious choice! 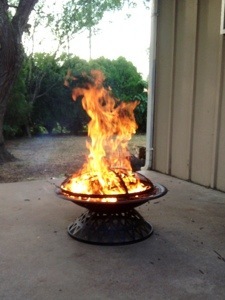 Two more stash burning projects in the books and three less skeins in my craft room! 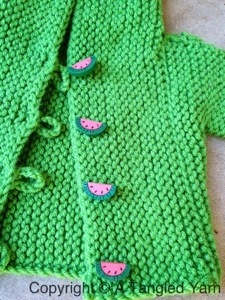 Not to mention two more adorable FOs for my emergency baby gift stash! I was worried about bleeding on my Little Coffee Bean Sweater. I didn’t knit a test swatch (bad knitter) and I haven’t washed two colors of Knit Picks Dishie together. 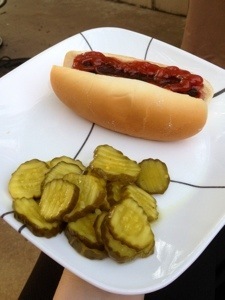 A couple of other bloggers recommended a vinegar bath to set the color. So while I was trying to decide my buttons, into a vinegar and water bath it went!! I used a white bowl so I could see if the water turned color. And after a nice soak…..no bleeding!! So I gave this a good rinse with plain water after its soak. 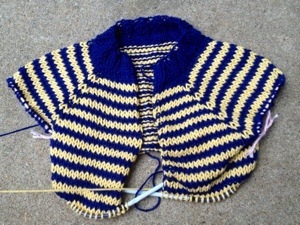 I’m still going to give this sweater a final bath and blocking after buttons to finalize the shape. But I feel much more secure knowing my blue wont turn my yellow to green! Have you ever had a project bleed? While I am deciding on the buttons for my first Little Coffee Bean Sweater, I couldn’t keep my needles silent. Now that I was comfortable with the construction of this garment, I wanted to try the color stripes the pattern is written for. And I had enough Dishie cotton to make another sweater. So here is Stashbustin’ #31! I have already divided for the sleeves and I am working down the body. I am running lowon yellow, here’s hoping I can finish! My sleeves may have to be solid blue. Just going to roll with the punches with this one. My Little Coffee Bean Sweater is almost done!! This is my Stashbustin’ #30 for those keeping track. I followed the pattern as written except for the color changes. 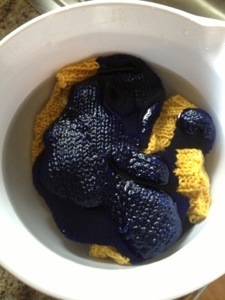 I knit the body in solid blue and the ribbed edges in yellow. I used 85.5 yards or 45 grams of Knit Picks Dishie Solids in Creme Brulee (yellow) and 180.5 yards or 95 grams of Knit Picks Dishie Solids in Jay (blue). It was a pretty quick knit as well. I’m just needing to do the buttons. But I can decide!! So here is where I am asking the wisdom of the knitting community. 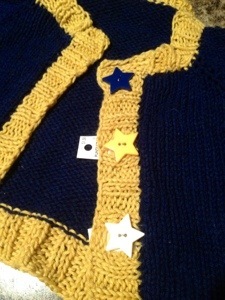 Do you like the white stars, yellow stars, or blue stars? 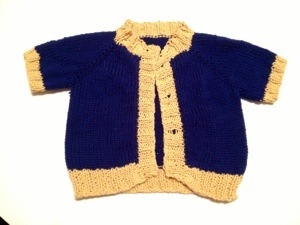 I recently have made a couple of Baby Sophisticate sweaters (here and here). The first was a gift for an old friend and new mom to be. 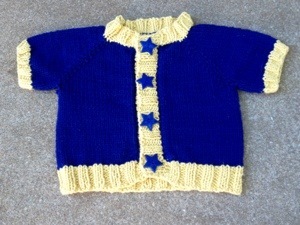 While at the shower, another mother picked up my knitted creation. 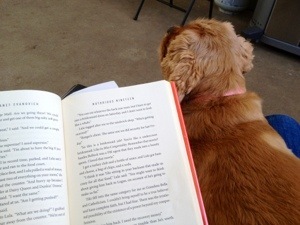 While not a knitter she gave me some “motherly” insights. She suggested a slightly longer body and bigger sleeves. Her reasoning was that babies grow longer faster than they grow wider (most of the time, lol). 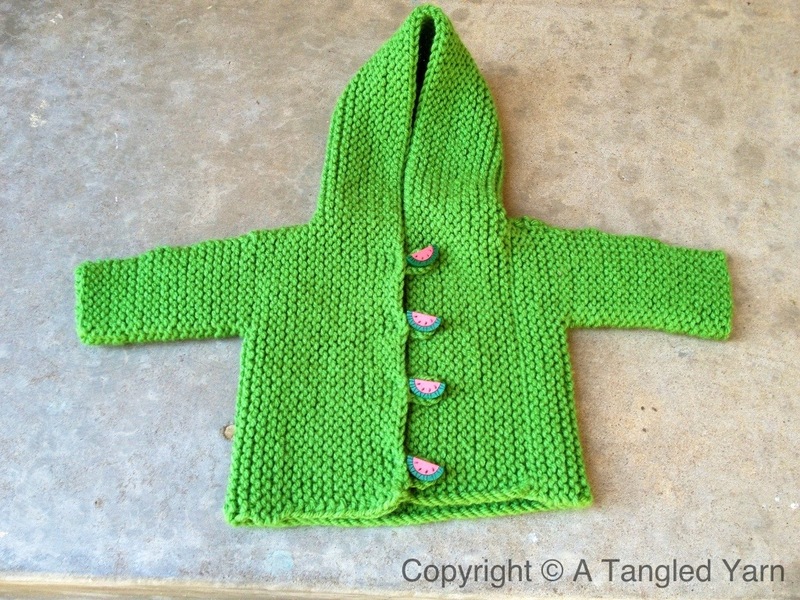 And that the baby will most likely have a shirt on underneath this jacket and the sleeves could use extra room to accommodate the fabric layers. So, I tucked these bits into my knitter brain and went home. 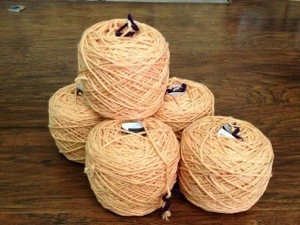 I pulled some Lion Brand Natures’s Choice Organic Cotton in Khaki from stash and grabbed my needles this past week. I cast on the smaller 0-3 month size. I knit the body according to the directions for the smaller size, with the change of working towards a total length of 7 inches instead of the prescribed 6. When I got to the sleeves I picked up the required 25 stitches and added three increases evenly across the first row for good measure. And I worked the sleeves for an extra 1/2 to 3/4 inches in length to match the body. This is my Stashbustin’ #32 project and it’s all done except for the buttons! I used 189.5 yards of yarn (just under two skeins of cotton) or 156 grams of yarn. This sweater is now headed for a bath and blocking. I love when I get real world feedback on my knits. I just hope that most of the time it’s positive!! The yard has been weeded and seeded. The apple trees have been harvested. The shrubs and tree limbs are trimmed back. 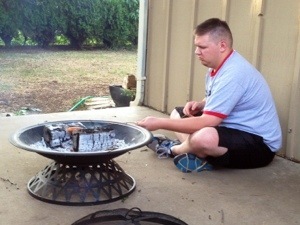 And the patio is now clean. All that is left is to wait for gentle fall rains and grass growing. Then the leaves will begin to change and fall and we will have a whole new set of chores to get this house ready for winter. My second attempt at Snug is done!! This pattern is by Hinke. This is not my first swing at this pattern and it won’t be the last! 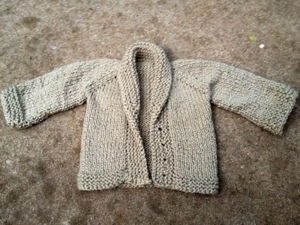 I used 212 grams or 288.3 yards of Knit Picks Brava Bulkly in Peapod. That’s just about 2 skeins plush a little of a third skein. The body is worked flat. The sleeves are done on DPNs. 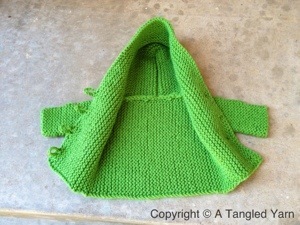 And the hood is knit flat and closed withe Kitchener stitch. 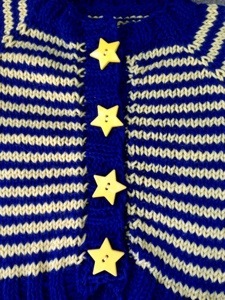 The part of this sweater that I really love is the buttons. I spotted them at JoAnns and I was in love!! The watermelons really save this project for me. I deviated from the pattern a bit and added four buttons instead of the pattern request of three. Into the FO stash this one goes. 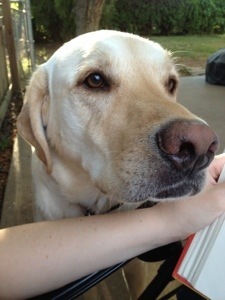 I love having some cuteness hidden away for a rainy day! Happy Friday to all!!! 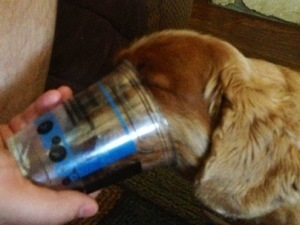 Sometimes You Just Need Ice Cream! 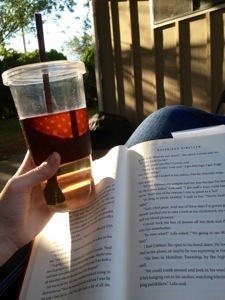 It’s hot….like really hot here in Kansas right now. And sometimes you just need ice cream. So the husband and I hit a local Sheridan’s for some custard. 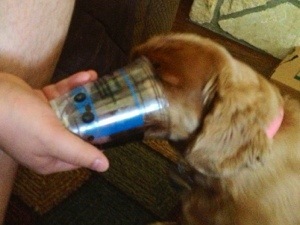 We let Chloe lick that last of the goodies from one of our cup. I gotta give her points for both enthusiasm and perseverance!! She managed to get all the way to the bottom, lol. Dex mean while had his taste and decided to sleep through the heat, lol. 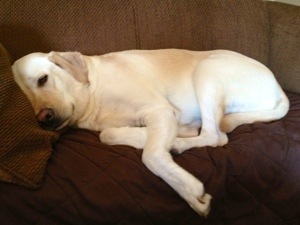 It’s a hard knock life for dogs in this house!